On Thursday, I spent the morning at the Los Angeles Regional Food Bank, where I go about 3-5 times each year to sort and package food that goes out to millions of hungry people across Los Angeles. 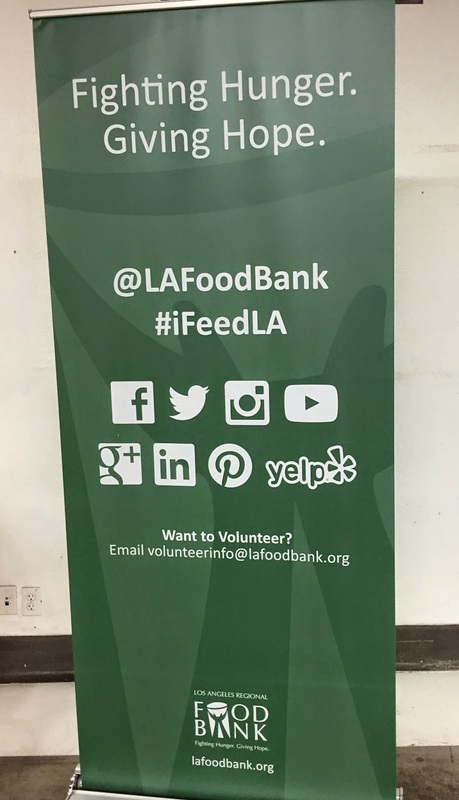 AWW covered the LA Food Bank's Feed SoCal Hunger Drive in July 2012, but the need for healthy food to feed hungry people still exists. The people who work and volunteer at the LA Food Bank are some of the nicest and passionate people in the nonprofit world, and I'm happy to donate my time and money to this great cause. Whether making food packages for the elderly, packing school backpacks for kids, or sorting through a mess of donated eggs, the Food Bank provides a fun service environment while allowing volunteers to help give much needed nutrition and hope around Los Angeles. Then, three days later I see a post from one of my favorite blogs, Chasing Doughnuts, about the author's mission to make monthly donations to another great cause that also happens to support my favorite LA Food Bank: Feeding America. For every dollar donated to Feeding America, the organization is able to distribute ten meals to people facing hunger through organizations like my local Food Bank! It took only two minutes to enter my information and make a donation, but that two minutes provided 250 meals to serve those most at risk. As you celebrate your Valentine, your Presidents, or your three-day weekend over eggs at brunch and donuts for dessert, think about signing up to volunteer at your local Food Bank or make a donation so that in-need families can have the same treats no matter their circumstances.